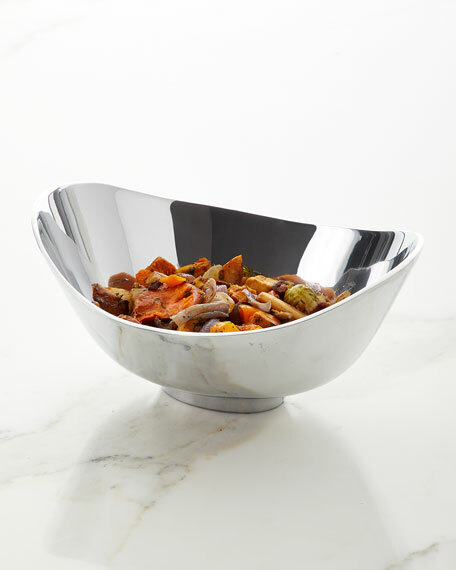 13"W x 9.5"D x 6"T.
Beatriz Ball's Mid-Century Collection exhibit sleek and practical metal serving pieces reminiscent of the best of Danish Modern tableware, but updated for today. Hallmarks of Mid-Century design included an exploration of new materials, exuberant forms, and an emphasis on function. The Mid-Century Collection includes several footed bowls, serving trays and a set of salad servers. An appeal to both hip millennials and nostalgic boomers. The Bergen Bowl is fresh and relevant for a new century. For in-store inquiries, use sku #2414091.